The recently launched Integrity built by Stirling & Son has had its first real sailing tests – and has even won its first race. 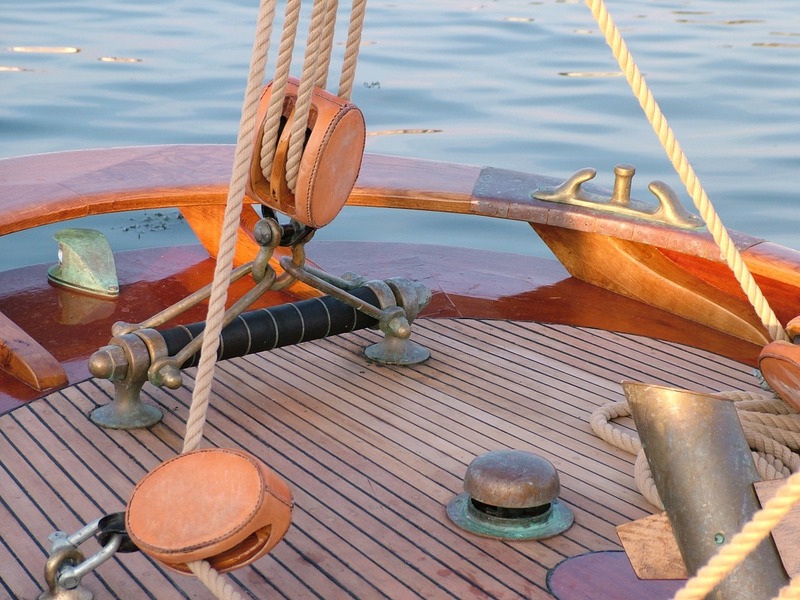 ‘We took Integrity to the British Classic Yacht Club Regatta at Cowes. As the trip up to the Solent from Plymouth was her maiden voyage, we decided to join the cruising class at the regatta. Nonetheless on Challenge Day half way through the week, two gaff cutters of Victorian vintage, Thalia and Aeolus, threw down the gauntlet. ‘The result was dramatic race in the wind and rain with thunder and lightening, hail stones at one point and so much heavy rain that at times the racing marks were obscured. 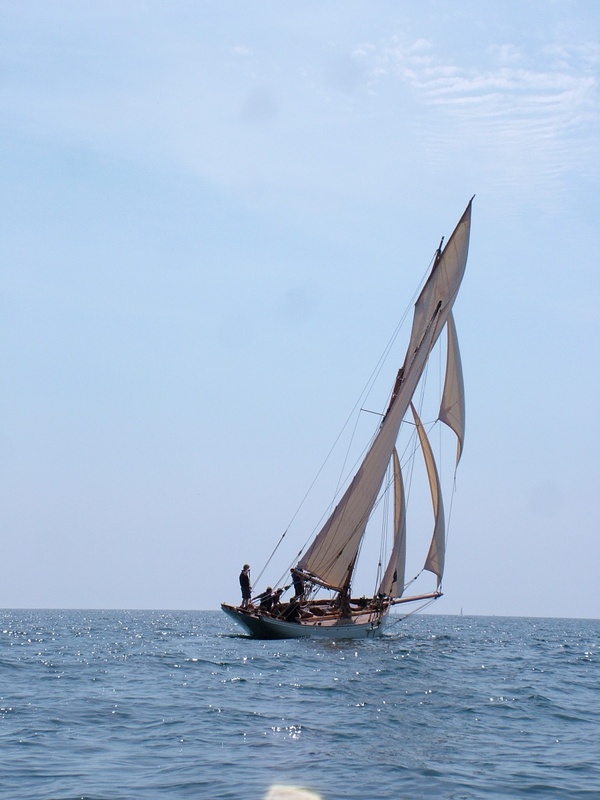 ‘At the end of July we attended Plymouth Classic Boat Rally, which was well organised and good fun. On the Sunday we raced and Integrity was the fastest around the course in her class despite my having lost the topsail sheet so that we couldn’t set the topsail. Her handicap was poor because of her sail area so we were not placed. 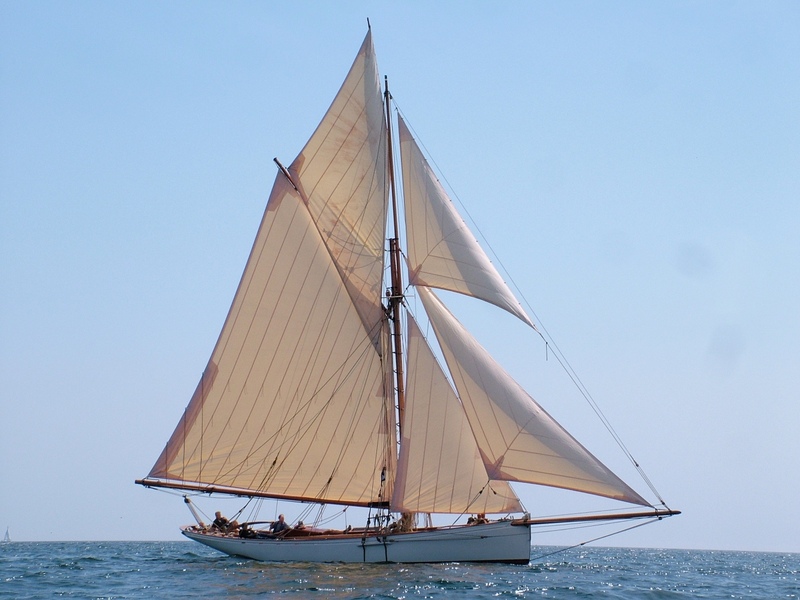 ‘She won the Sutton Harbour Commissioners Cup for best boat and the People’s Choice for best boat, the prize for which is a fantastic half model of the 40ft rater Reverie. ‘The 14ft Stirling & Son dinghy won the best dinghy prize. ‘We have made two trips to the Eddystone Lighthouse as well – the Eddystone is 12 miles south west of Plymouth Breakwater. On one of them we had a full crew on board and were beating out to the lighthouse when the topmast cap shroud on the weather side came undone. The jib topsail was set and the topmast broke immediately. 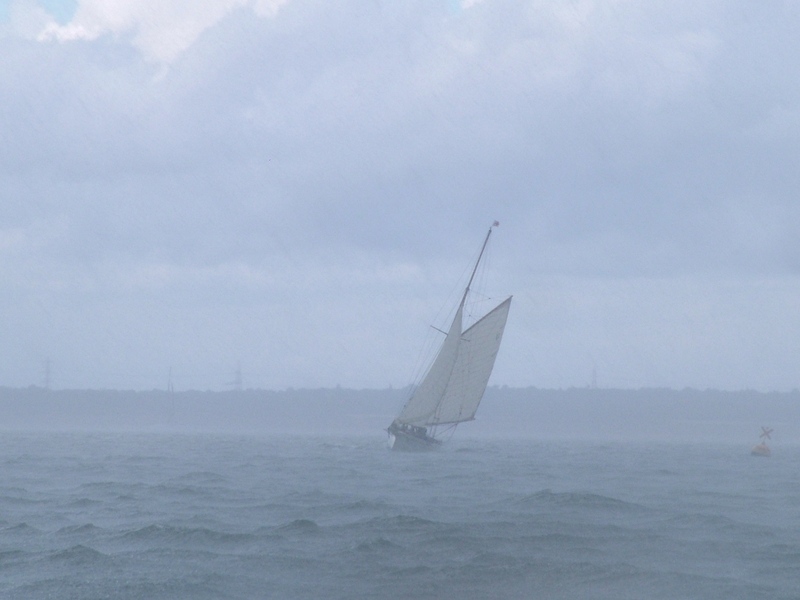 We hove to, pulled the sail out of the water, tidied away the sheets, climbed up the mast hoops and over half an hour unshackled all of the wire and sent the 17′ of broken spar down to the deck where it was lashed down, sent all of the wire down, coiled it and stowed it below. With all tidied away we sailed on. ‘When reaching around the lighthouse we were surfing on the waves. On the way back we sailed downwind and went up the mast again and got the stump down onto the deck. We reached the Plymouth Breakwater in just over an hour which represented speed of approximately 9 knots. A new topmast has been made and sent aloft with an improved cap shroud. ‘The second trip was with my wife Sara in relatively windy weather. We had a reef in the main and the jib. The wind was F5 to F6. We reached to the lighthouse and had to tack the boat as we felt we couldn’t gybe her in those conditions. We sailed back close-hauled. We made an average speed of approximately 7 knots. It was very exciting. The boat feels safe and powerful. 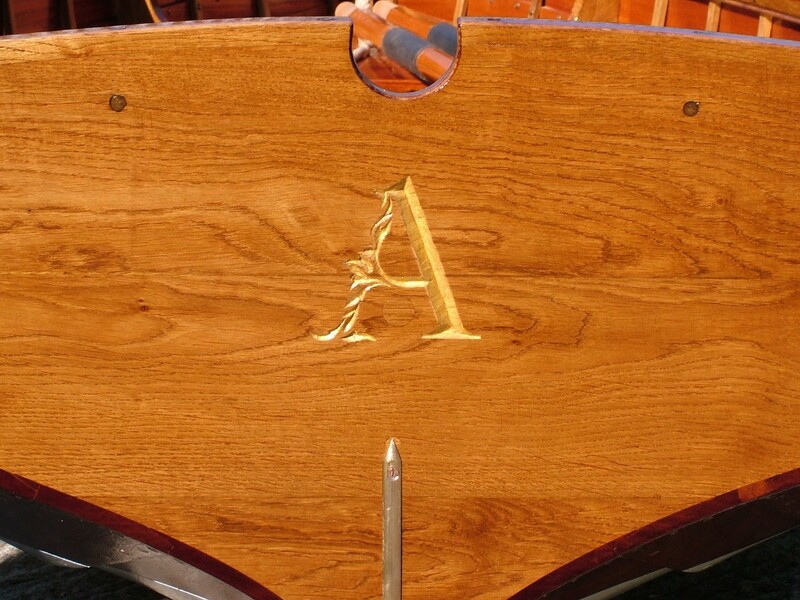 ‘Meanwhile, we recently sent out dinghy build number 21. We often get asked to carve a name or letter in the transom, but this letter, inlaid with gold leaf, was exceptionally complicated! 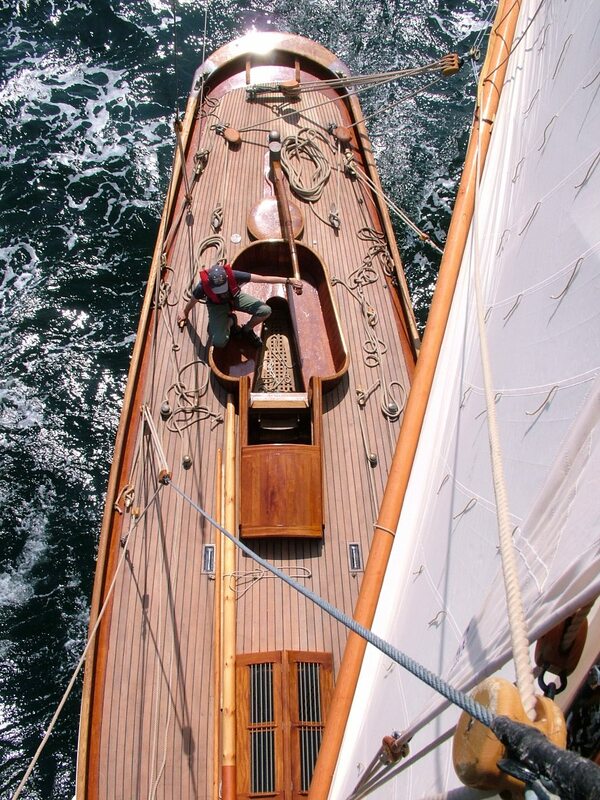 Based at Tavistock, Devon, Stirling & Son undertakes traditional yacht building and wooden boat repair and restoration, and sells some lovely sets of plans and can be contacted by phone on 01822 614259 or reached at the company website at www.stirlingandson.co.uk.